Indie Basement: Beak>, The Beta Band, Fenster, and more. It’s the last day of summer and I am writing you from the beach where I am basking in the fading glow of the season while feasting on panzanella salad made from the last tomatoes from my garden. Not really, I’m writing this in my kitchen and just ate some leftover pasta. But I digress! Autumn in New York is the best (the season / place, not the Richard Gere / Winona Ryder movie) and, speaking of harvests, it’s a bumper crop in the basement this week. We’ve got great new albums from BEAK> (the trio that includes Portishead’s Geoff Barrow) and Berlin’s Fenster, plus a 20th anniversary reissue of The Beta Band’s The Three EPs, the return of Zoos of Berlin chillout side project South South Million, and a solo record from Cool Ghouls’ Pat Thomas. 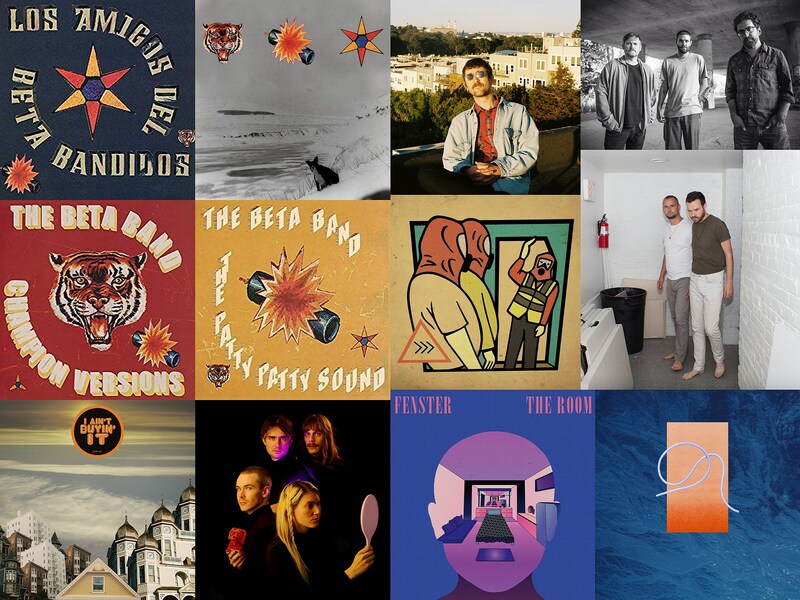 If you need more Basement-approved music, there’s the new Suede album (which I haven’t spent enough time with, but like), and Liars album, plus the weird, Troma-esque Timmy’s Organism video, a new song from Kip Berman’s The Natvral solo project, and new Kero Kero Bonito. If you’re in NYC, you should also head to the Brooklyn Flea Record Fair on Saturday. Beak>, the trio of Geoff Barrow (Portishead), Billy Fuller (who plays in Robert Plant’s band) and Will Young (Moon Gangs), have never changed their MO across their three albums, still adhering to their creative rules where all music must be recorded live in one room with no overdubs, and only using edits to create arrangements. For their third album, titled ‘>>>,’ they are still pulling from motorik postpunk, Can-style krautrock, proto-metal, and dark folk — all of which sounds like it was recorded in an abandoned warehouse — but it’s all more focused this time. The songs feel more thought out, with more vocals than they’ve ever used before, while the instrumentals are more intense. It’s the first Beak> album that doesn’t feel like you’re listening to some obscure, albeit super cool, soundtrack to an Italian giallo thriller from 1980. For example: “Brean Down,” and “RSI” are driving rock songs, while “Harvester” sounds like a classic rock from a nonexistent 1973. There are still some great soundtracky moments here, though. “The Brazilian,” a creepy track that is both funky (in an Ironside kind of way) and really heavy, could be an opening credits sequence, and “Alle Sauvague,” with its mutant disco vibe, could compliment a tense chase sequence in, say, a crowded illegal underground dance club. The record ends with my favorite ever Beak> song, the pretty, folky “When We Fall” — which you may have heard on 2015’s <KAEB EP — but now has a new extended outro that takes the song into krautrock territory and brings the album full circle. Beak> are touring North America in October. Steve Mason just announced his new album and shared its first single, but I’m a little surprised we haven’t gotten a reunion announcement for his old group, The Beta Band, whose classic The Three EPs came out twenty years ago (September 28, 1998 in the UK and January 1999 in the U.S.). The Scottish band appealed to a lot of what was going on the late ’90s indie — new dance culture, and folks tired of Britpop but who still followed UK music — with a sound that was both hippy-ish and owing a little to the Madchester scene of a decade prior, yet it felt very now (then). As the title suggested, it collected the band’s three EPs up to that point — 1997’s Champion Versions, and 1998’s The Patty Patty Sound and Los Amigos del Beta Bandidos — but only the most NME-memorizing record store frequenters heard those ahead of this. Speaking of, this is a record I distinctly remember hearing first in Other Music, and when it (and lead track “Dry the Rain”) was used so memorably in 1999 music nerd comedy High Fidelity, it felt very on the money. The record was such a word-of-mouth grower that most people, at least in the U.S., were still just getting into The Three EPs when The Beta Band dropped their debut album in the summer 1999 (which was a flop that the group all but disowned, but it’s worth revisiting). It’s got all of most people’s favorite Beta Band songs — “Dry the Rain,” “B + A,” “Dog’s Got a Bone,” “The House Song,” “She’s the One,” “Needles in My Eyes” — nothing else sounded like it at the time, and its organic vibe still sounds awesome today. They just reissued The Three EPs as 20th anniversary box set with each EP getting its own color of vinyl: Champion Versions is red; The Patty Patty Sound is on double yellow vinyl; and Los Amigos Del Beta Bandidos is blue. There’s also a remastered CD of the whole thing. For those who don’t need it on 45 RPM multi-disc, a more standard double-LP version will be out October 12. Because Music will be reissuing The Beta Band’s excellent two other albums — 2001’s Hot Shots II and 2004’s Heroes to Zeroes — on vinyl as well. For those who just want all the hits, Because Music also just reissued The Best of the Beta Band as a two-CD set. Chillout offshoot of Detroit’s Zoos of Berlin get darker on first LP in six years. I found this fascinating (and kind of disturbing) video of my dad, shirtless, acting like he’s suffocating. He made it in the early 80s with a tube video camera. During that time he was an ambulance driver in Detroit with four kids at home. The video is something of a mystery to my family. When combined with the celestial bodies and endless smoke taking up the rest of the frame, I feel like there’s a communication between his video and mine. Either way, I had to use it. For whatever reason, Berlin quartet Fenster (who are half-German and a quarter each French and American) are a band I tend to forget about in between albums, and often forget what they sound like or that, oh yeah, I really liked that last album. It’s nice to be reminded with a surprise record which is what The Room was for me. If you’re wondering, the title is not a homage to the Tommy Wiseau cinematic classic — not that you thought that — but a reference to the album’s recording process. Fenster decided with this one, that they would compose and arrange the songs together in one room, and the album was tracked live in a house where all four members ate, slept, and played together. The group have always used electronics in a very organic way — part krautrock, part folk pop — but The Room feels more alive, with songs melting into the next. The synthesizers are what really, like the Dude’s rug, tie The Room together. They sound otherworldly, mysterious and inviting, like sounds the BBC Radiophonic Workshop created in the ‘70s and early ‘80s. It’s the thread between songs like the gorgeous, soft-rock sound of the album’s title track, to the clinical krautrock vibe of “HBW” and “Feel Better,” to the laid-back and lightly funky “Groovin’ with The Eternal Now,” to the quirky pop of “Haha LOL” and the album’s delicate, crystalline closer, “Two Doors.” It’s a truly lovely record and I promise not to forget about Fenster again. Pat Thomas plays bass, sings and writes in San Francisco’s Cool Ghouls, a group who sound like they could’ve been around in the Summer of Love. He sticks around the same era for his new solo album, I Ain’t Buying It, but pulls from a more disparate, idiosyncratic well of influences, like Harry Nilsson and Brian Wilson. It’s a quirky, inventive and fun record as you can hear on “Are You Okay.” There might even be a little Spike Jones (the ‘40s bandleader, not the director) in the sound-effects-filled arrangement and production. It’s weird, it’s tuneful, and you may be asking if Thomas is okay by the end. I Ain’t Buying It is out October 26 via Empty Cellar Records. Pat will be performing at this year’s Le Guess Who? Festival in the Netherlands.